Looking ahead from the beginning. For over 50 years. How ERICH BAUMEISTER GmbH went from a straw wreath wrapper to an industry expert for professional bundling, finishing and packaging. It all started in an old pigsty of the parents. Renate and Erich Baumeister founded their company on 1 January 1964 at Erikaweg 6, Münster. The couple originally wanted to import and sell glass-ceramic pottery, but this soon changed. When sales did not meet expectations and a wholesaler asked if Baumeister could supply him with Strohrömer, this was the starting signal for another line of business. For Erich Baumeister not only recognized the problems that arose when winding these wreaths with the expensive and poorly processed iron wires - he solved them! He tinkered, tried, asked, looked for alternatives and - most importantly - never gave up on setbacks. "The first attempts with poly yarns were missing", the company founder remembers the first years. "The mice had gnawed off all the yarn in one night. The solution was plastic wires, which were also used in the production of roofing membranes. But here, too, the next problem was already waiting: they had to be wound up. Baumeister invested in an armature winding machine and had a suitable tool built. But with a machine and the right material, no customer had yet been won. Baumeister travelled from Roman manufacturer to Roman manufacturer, visited florists, nurseries and presented his machine. He was successful - and did not rest on his laurels. He invested in a bobbin tool to guarantee a precise yarn path with a yarn brake. In doing so, he oriented himself to solutions that already existed in the textile industry. "Once the technical requirements had been met, we were able to think about expanding our sales." The first customers from abroad came via wholesalers from the floristry sector, and Baumeister was exporting for the first time. 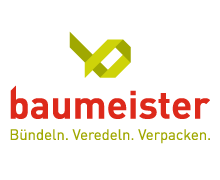 In order to open up new markets and win new customers, Baumeister was present on the industry exchanges throughout Germany. "That was a great effort," recalls Erich Baumeister. But he also remembers the great support he received from his family. Daughter Ute and son Dietmar travelled to the stock exchange in Kassel when their father was flu-stricken. "She had just got her driver's license. Baumeister moved again and again, enlarged his production facility and expanded his range of products. They had moved from the old Schweinstall to the Entrup-Lödde farm, later to Kinderhaus in the Thoring farm, in the Kotten Schulze Dieckhof in Sandrup. The winding was even done in the clubhouse of the dog friends Coermühle. The company settled in the barn Große Laxen in Gimbte and moved to the Baumberger Hof in Münster-Nienberge. In 1984 one finally took over an industrial hall in Laer. This is still the headquarters of Erich Baumeister GmbH. Now that there was enough space, Renate and Erich Baumeister invited customers to the open day. They also made their first contacts in the East shortly before the fall of communism, during the Easter holidays in 1989. In the same year, the Baumeister family celebrated their 25th company anniversary with their daughters Ute, Silke and Meike as well as their son Dietmar. But even if the turnover had already crossed the million mark by this time, the family knew that they always had to be prepared to break new ground. In the meantime, son Dietmar runs the company. In 2004, he bought the ADT binder product from his Andalusian partner Agrotrade in 2000 and developed it further. In autumn 2016, Baumeister took over spooling and double-wire twisting machines as well as rope twisting machines from the Seidelmayer linen twisting mill in Versmold, when it closed down its operations. In 2017 her wife Isabelle started with her label LOOP & BOW and is currently opening up a completely new market in the creative sector. The former specialist for crown wrapping machines has become a unique industry specialist for bundling, finishing and packaging. Erich Baumeister GmbH has a wide range of winding, slitting and wrapping machines at its disposal. It operates its own injection moulding machines, a small mechanical engineering department - and it is growing. Dietmar Baumeister moves in 2019. The production and storage areas are expanded to 4,000 square meters. "We have just invested massively," he says. "We are proud that as a family business we have been able to survive successfully on the market for more than 50 years and that our customers always get what we promise - or perhaps even a little more," says Baumeister. All this was and is only possible because the unconditional will to find a solution for every problem, the enthusiasm for the product, reliability and the courage to break new ground have been the most important company values of the Baumeister family from the very beginning. This was true in 1964 in the old pigsty as well as today in the modern production facilities of Erich Baumeister GmbH. This offer is exclusively for industry, trade, commerce, the professions, government agencies and institutions. All our prices plus value added tax, without customs and other fees, ex work.